Art offers children a fun, nonverbal, symbolic means of communicating. When the capacity for verbal expression is not fully developed or a child/teen may be unable or unwilling to verbalize their feelings, art inspires communication. This can be particularly true for children who are experiencing traumatic events such as medical treatment or the chronic illness of a sibling. The feeling mandala is an example of an art directive utilized by art therapists to elicit the identification and expression of feelings. The feeling mandala can also be useful for parents to introduce their child to empower self-expression. The art directive can be completed with basic art materials such as paper and crayons, but for increased engagement it can be advantageous to use novel drawing materials such as card stock weight paper, oil pastels, watercolor paints, gel pens, and Sharpie markers. 1. Trace a large circle on a blank piece of paper. Tip: Keep in mind that creating your own feeling mandala alongside your child or to use as an example, will encourage your child’s own expression and lessen their feelings of self consciousness. 2. Guide the child to identify the feelings they are experiencing and fill the circle with these feelings. Encourage the identification of both positive and negative feelings. Each feeling will be represented by a color of their choice. The child can also use symbols to denote feelings (e.g., a heart for the feeling of loved). Tip: If a child is having a difficult time identifying feelings, a list of age appropriate feeling words to choose from can be helpful. 3. 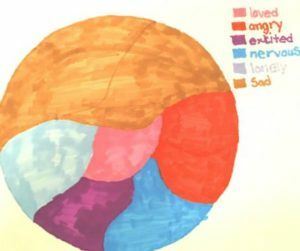 Explain how the amount or size of each color used in the circle will be proportionate to how much they are experiencing a particular feeling. For example, if they are feeling mostly frustrated and a little hopeful, a large area would be colored in for frustrated and a smaller area for hopeful. Tip: Focus on the process of the art making not the product. Keep in mind there are no mistakes when creating art, and no right or wrong identified feeling, color choice, or symbol. 4. Demonstrate how to create a color key to identify the feelings associated with each color (please see feeling mandala examples). 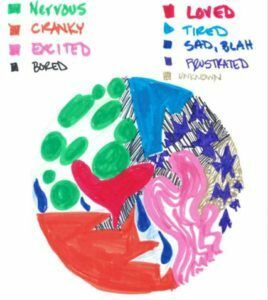 Tip: It could be helpful if the parent first provides examples from their own feeling mandala (e.g., I feel sad because our family is apart, e.g., I am excited for our upcoming movie date). 6. Feeling mandalas can be created on a daily or weekly basis. They can be kept in a journal, separate sheets of paper, and created with a wide variety of materials. Most importantly, have fun and enjoy the creative process with your child. Dr. Jo Wallace is a neuropsychologist with the Child Neurology Team at Stanford University and a board certified art therapist with the Child Life Team at Lucile Packard Children’s Hospital at Stanford. Dr. Wallace is also an adjunct professor at Notre Dame de Namur University where she teaches and inspires future art therapists. She finds art therapy as invaluable tool to assist with engaging and supporting pediatric patients in both assessment and therapy.